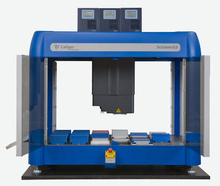 The Sciclone NGS (Next Generation Sequencing) Workstation is the most capable automated solution for high-throughput sequencing sample preparation. Built on the Sciclone G3 platform, the NGS Workstation is a complete benchtop solution for library prep, sequence capture, and normalization. NCGR is using the Sciclone for automation of sequencing library preparation and target capture applications. Sequencing libraries made using the Scicone NGS are showing greater reproducibility and uniformity than those made using multi-channel pipettes, and are lessening the risk of repetitive strain injury. NCGR's Sciclone technician just attended a two day Advanced Maestro Training (the controlling software language) workshop.